In this post, we'll explore a very practical but complex subject: telling time. Please give credit back to this blog if you wish to share the post. The rough pronunciations suggested in the brackets are meant to provide some approximate guidance, but are not always exact. 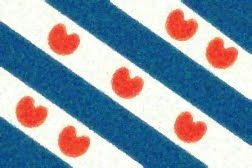 I'll start off with a very important warning for us English speakers: Frisian follows the same pattern as Dutch for the half-hour. It looks ahead to the hour that is coming up, not back to the hour past like we do in English! E.g., our "half past four" is literally a half until five! Literally: How late is it; what time is it? It is twa oere. It is sân oere. Literally: halfway to five; half past four (4:30). You can say: healwei ienen (12:30), healwei twaen (1:30), healwei trijen (2:30), healwei fjouweren (3:30)... healwei seizen (5:30), healwei sânen (6:30), healwei achten (7:30), healwei njoggenen (8:30), healwei tsienen (9:30), healwei alven (10:30), and healwei tolven (11:30). Notably, the twenty-four hour clock ("military time") is also used. If we want to say that it is fifteen past an hour, we use the preposition oer, pronounced with a long "oo" sound. [OOr]. However, another way to say fifteen past is to say the hour, oere, and then fifteen. It is confusing, yes. The hour name comes before in this case. Listen for that critical extra schwa that distinguishes the word for "hour," oere [OOr-ruh], from the word for "over," oer [OOr]. Anyways, back to quarters. Conveniently, the Frisian word kertier looks a bit like the English word "quarter." Stress is on the second syllable, which is said with a long "ee" like in "tear," which we are all probably shedding by now as we try to tell time in Frisian. The first syllable takes a short "ih" like in "kit." Kertier foar fjouweren. Kertier foar achten. Quarter to four. Quarter to eight. Twenty after five is: Tweintich oer fiven. Finally, telling time with "twenty five" before or after can get really obnoxious. The half-hour is used like an anchor, which you'll remember looks forward to the next hour unlike in English. So, twenty five to seven--or 6:35 to the English eye--is literally said "five over the half to seven." I wouldn't recommend sweating about this too much. Just be aware that it's something you might see. The basics of healwei, kertier, oer, and foar should take you very far.